LTS-70T is a pulse tube based cold head developed for applications where low vibration levels are important. It is used in semiconductor industry where it can be attached to SEM and FIB devices without compromising resolution as well as in sensor development and cryo pumping applications. The base temperature of the cold head is below 50K and nominal cooling power is 2.5Watt at 70K with the low vibration configuration. 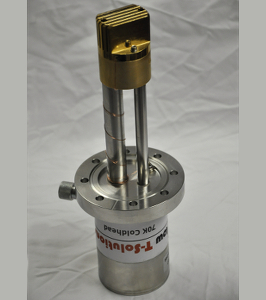 The standard design includes a CF DN63 room temperature flange for easy attachment to vacuum systems.